Behind the Times – Behind the Markets: What’s Missing in Technical Analysis? Over the past quarter-century participation in the financial markets by individual traders and investors has grown tremendously, both directly and through company-sponsored retirement programs. Personal computers have become more powerful and less costly, while technical analysis software has become more prevalent. As a result, an ever-increasing number of traders have come to rely upon technical analysis as the basis for making their trading decisions. Yet, war stories publicized in the mass media suggest that traders today are no more adept at trading than they were decades ago – before the age of personal computers and technical analysis software. What’s behind this paradox? On one hand recent technological advances have put more powerful computers and trading software onto the desktops of traders than were used by NASA to send astronauts to the moon in the late 1960s. On the other hand traders now are no more likely to make profits than their predecessors who relied on nothing more than paper charts, rulers, #2 pencils and hand- held calculators. The answer can be found through a better understanding of the structural changes that have transformed the financial markets since the mid-1980s. Due to the globalization of the world’s economies, coupled with advances in information and telecommunications technologies, domestic and foreign markets began to move in concert, affected by common financial, political and economic events. Individual financial markets today no longer trade in isolation from related markets. Instead, intermarket forces increasingly affect daily price action and the underlying trend direction of each market. Despite improvements in the speed, power and user friendliness of personal computers since the late 1970s when I began developing trading software, the underlying basis of technical analysis that is implemented in the current generation of trading software is hardly different from that which existed prior to the advent of personal computers. Technical analysis remains fixated on the analysis of a single market’s past price data, using a wide assortment of technical indicators, most of which were developed decades ago. This restricted approach ignores the ramifications of the interdependencies between markets and thereby fails to utilize relevant intermarket data from related markets that could be instrumental in developing more effective trading strategies for today’s global markets. Clearly, these structural changes in the financial markets suggest that this single-market approach (with its emphasis on trend-following lagging indicators), while reasonably effective in the past when the markets were more independent and less volatile, is no longer adequate and should be broadened to encompass intermarket factors. Yet, to date it hasn’t. That’s one major reason why so many traders have not benefited from computing technology to the extent that one would have expected by this time. Traders can no longer afford to analyze each market in isolation, no matter how many single-market technical indicators are used and how much back-testing and optimization is conducted. Remember that past performance is not indicative of future results! Whether you trade individual stocks, exchange traded funds, options or futures, you should understand the implications of this paradox on your own trading and incorporate intermarket analysis in some form into your trading game plan. Otherwise, you risk being part of the road kill that has taken its toll on individual traders, exacerbated by the high tech and Internet bubble burst that began in early 2000. Most traders now, when asked, acknowledge that the financial markets are intertwined, and that intermarket dynamics strongly affect the daily price action and trend direction of each individual market. Yet, interestingly, intermarket analysis remains a mystery to many traders, particularly newcomers to the markets. The ones I talk with have hardly begun to apply any sort of intermarket analysis to their trading. Instead, many still limit their analysis to only one market at a time, while others “eyeball” intra-day or daily charts on one or two related markets. Typically, this is done subjectively simply by comparing price charts. The outcome is an incomplete picture of what is happening today in the markets that they are trading, and more importantly what is most likely to happen in those markets in the immediate future. No wonder traders continue to swap war stories about their trading losses. Admittedly, it will always be necessary to analyze data from each individual market. However, it is no longer sufficient to look only at each individual market. The markets are now so interrelated that a thorough analysis of any one market cannot be conducted effectively without an intermarket perspective. Intermarket analysis is by no means a new or radical concept that corresponds to the recent economic globalization. With both cash markets and numerous contract months trading simultaneously on specific commodities, and with closely related commodity complexes such as the grains and meats, intra-commodity and inter-commodity analysis has been performed by commodity “spread” traders for probably the past 100 years or longer. With the more recent proliferation of financial futures on stock indexes, currencies, interest rates and energies, intermarket comparisons between various futures markets and equity markets, as well as between sectors within the equity markets, are performed to identify short-term confirmation or divergence, which provides insight into impending changes in market trend direction. Futures on the S&P 500 Index, Nasdaq 100, The Dow, Treasury bonds and notes, as well as other financial futures markets including crude oil, the CRB Futures Price Index and the U.S. Dollar Index are now recognized as having strong influences on domestic equity markets, and therefore are followed by many stock traders. Although easily discernible relationships appear to exist between these markets when their price charts are compared with one another, such apparent relationships are often ephemeral. This is because market relationships are dynamic, with changing strengths, as well as varying leads and lags to one another that shift over time. Due to the complexity of the relationships between so many related markets, both domestic and international, it is difficult for an individual trader to perform intermarket analysis, even at a rudimentary level. Typically two markets are compared to each other by calculating linear correlations or by subjectively comparing their price charts. Traders assume incorrectly that the effects of one market on another are either direct or inverse in a sort of one-to-one causal relationship, which occur without any leads or lags. These approaches, based upon unrealistic assumptions with respect to how the global financial markets operate, fail to capture the simultaneous combined effects of numerous related markets on a specific market. I am neither suggesting that single-market analysis be replaced entirely by intermarket analysis, nor that intermarket analysis be ignored because it is just too difficult to implement. This is not a choice of having to decide between using one or the other technical approach. Intermarket analysis builds upon the strengths of single-market analysis, adding another dimension to the analytic framework, so that markets can be analyzed both internally and externally. Combining single market with intermarket analysis offers traders the best of both worlds. So how can this be done with reasonable effort? One way that I have been successful at integrating intermarket analysis with single market analysis is through the use of a mathematical tool called neural networks. 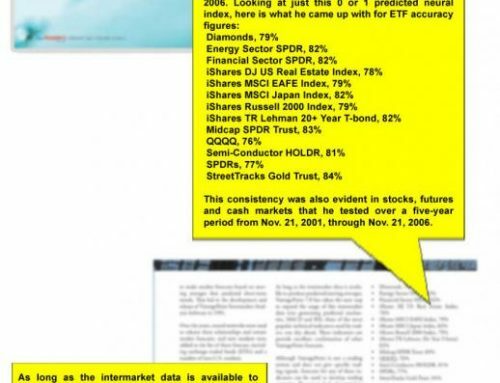 This tool is useful for finding hidden patterns and relationships between related markets, which afford early warnings of impending changes in market direction – often days before they become apparent on traditional price charts. In a simple sense neural networks model how the human brain processes information. They are used to perform pattern recognition and market forecasting. Neural networks are comprised of individual neurons organized in layers and interconnected through network architecture with mathematical weights attributed to each connection. The architecture includes an input layer, hidden layer and an output layer. For example, one neural network-based model that I have developed to forecast the U.S. Treasury bond market is based upon 10 years of historical price, volume and open interest data on Treasury bonds. Additionally, the raw input data includes the following related markets that through research have been found to have a strong influence on bonds: New York Light Crude Oil, the CRB Futures Price Index, Comex Gold, the Japanese Yen, the U.S. Dollar Index, the Eurodollar, the S&P 500 Index, cash bonds, and the Deutsche Mark. Similarly, to forecast the Dow Jones Industrial Average, data from related markets including the Nasdaq 100 Index, S&P 500 Index, bonds, the New York Stock Exchange Composite Index, and the Dow Jones Utility Average are incorporated into the model. Once the raw input data has been selected, it is preprocessed using various algebraic and statistical methods of transformation, in order to assist the neural network to learn the patterns and relationships between the data during a process known as “training”. The hidden layer is used by a neural network for internal processing to store its “intelligence” during the training process. This layer is composed of neurons where the network recodes the input data as the patterns and relationships in the data are identified. The output layer is where the network’s forecasts are made. Various types of forecasts can be developed, such as predicting the next day’s high, low and close, as well as forecasting different technical indicators such as a predicted 5-day moving average for two days in the future or a 10-day moving average for four days in the future, which can then be used as part of more complex trading strategies such as moving average crossovers. There are numerous learning algorithms that can be used to train a neural network. Each one has unique performance characteristics. All of the algorithms attempt to minimize the overall error in the network’s forecasts. Training a neural network involves an iterative process in which the neural network learns underlying hidden patterns, discerns leads and lags and identifies nonlinear relationships within the data from repeated exposures to the input data. Learned information is stored by the network in the form of a weight matrix, with changes in the weights occurring as the network learns. Then the neural network generalizes through the training process to related but previously unseen patterns. Once trained, a neural network can be used as a market-forecasting tool. Overtraining, which occurs when a neural network memorizes the subtleties and idiosyncrasies particular to specific training data without forming the capacity to generalize to new data, should be avoided. This problem is similar to curve-fitting or over-optimization when performing back-testing and optimization on rule-based trading strategies. An overtrained network performs poorly on out-of-sample test data and subsequently when making its forecasts during real-time trading. Testing is done by creating an independent test file made up of data that had not been seen by a neural network during the training process. In the testing mode the neural network is given these new inputs and utilizes the representation that it had previously learned to generate its forecasts. This allows the network to be evaluated under simulated trading conditions. This is analogous to “walk-forward” or “out-of-sample” testing of rule-based trading strategies. Performance results from various neural networks on test data can be compared before deciding which specific neural network to apply in the real-time application. Depending on the comparative test performance results, changes may need to be made in the selection of input data, preprocessing, network architecture, etc., and retraining performed before selecting the final application network. With the world’s financial markets continuing to meld together, technical analysis as an analytic discipline should be broadened to encompass intermarket analysis. Before long, intermarket analysis will become more widely adopted by traders as they recognize its importance to their trading, just as back-testing and optimization of single-market trading strategies became the mainstay of computerized single-market analysis in the last two decades of the twentieth century. Nothing remains constant. The interconnectedness and interdependence of today’s financial markets is unprecedented. The need to incorporate this reality into technical analysis methods is undeniable. Fortunately, mathematical tools such as neural networks are well suited to analyzing market data from both a single-market as well as an intermarket perspective. Through the use of such tools individual traders can bring to bear the full capabilities of today’s powerful computing and quantitative technologies to achieve the ultimate goal of technical analysis: to identify and anticipate impending changes in prices and trend direction in sufficient time to profit from this insight. It is time to apply 21st century tools in order to profit from the tremendous financial opportunities that the 21st century financial markets have to offer those in the know. Louis Mendelsohn is president and chief executive officer of Market Technologies, Wesley Chapel, Fla, a trading software development firm founded in 1979, that specializes in quantitative trend forecasting. His firm’s software, VantagePoint, uses neural networks to perform intermarket analysis and predict market trends with nearly 80 percent accuracy for interest rates, currencies, stock indexes and energies. Mendelsohn’s recent book entitled Trend Forecasting with Technical Analysis: Unleashing the Hidden Power of Intermarket Analysis to Beat the Market (MarketPlace Books) is available at Market Technologies’ Web site, . Mendelsohn can be reached by e-mail at Louis@ProfitTaker.com or by phone at 813-973-0496 or 800-732-5407.